Ocean Grove is a charming New Jersey Shore town where recreation, history, and religion all prosper in "God's square mile"
The town is steep in religious tradition and welcomes visitors who seek to stay in lovely cottages and enjoy quiet summer evenings and peaceful strolls along the boardwalk without the 21 st century commercial, honky-tonk, noisy attractions found in other beach destinations. The town has maintained its communal and religious ties with the original Methodist Camp Meeting ground. It is a dry town with a ban on alcohol and restricted use of the beach on Sunday until after noon. The wooden boardwalk along the beach has maintained its natural beauty with no commercial amusements or concession stands. 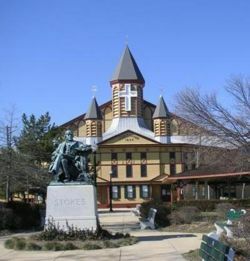 Ocean Grove is entered in both the National Register of Historic Places and the New Jersey State Register of Historic Places. 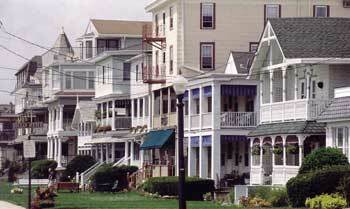 For years, Ocean Grove has been known as "God’s Square Mile". It is unique with its community of historic tents owned by the Methodist Camp Meeting Association and rented out. 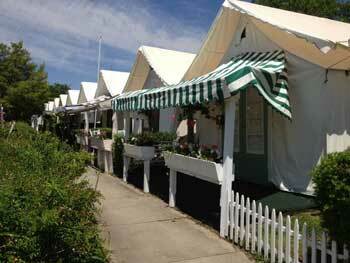 In 1878 there were 506 tents in Ocean Grove. Today, over 100 tents remain to the north of the Great Auditorium. The tents are made with canvas with a striped canvas-covered porch, a plain canvas-covered sleeping and living area in the front. It has a wooden shed behind the tent that contains the kitchen, bath and dining area. The size of the tents, including the rear wooden structure, is a little over 300 square feet. You don’t have to belong to the church to rent a tent, but if you are interested in renting, there is a long waiting list, up to twenty years. 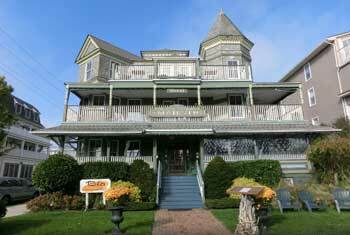 It’s a wonderful place for a a day trip or a weekend getaway with plenty of charming, Victorian bed and breakfast inns to choose from. There is plenty of free street parking with no meters. This 7,000-seat auditorium on Pilgrim Pathway is a remarkable wooden structure. Almost as big as a football field, it has one of the largest pipe organs in the country. If you aren’t here for Christian worship, go to a Saturday night show or one of the many other year round concerts and performers that appear in the Auditorium. 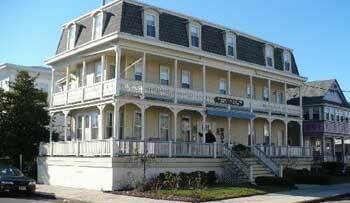 If you're a history buff, take a Historic House Tour offered by the Historical Society of Ocean Grove. 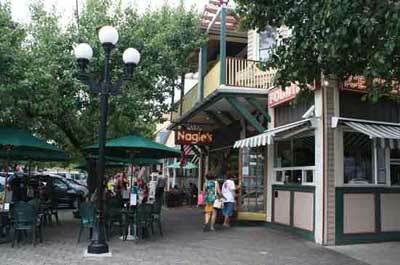 Looking to do a little shopping or browsing, stroll along tree lined Main Avenue with many small eateries and interesting shops. This beach front attraction comes alive in the summer with evening Summer Band concerts @ 8:00 pm, Sunday morning worship services @ 9:30 am and the Gospel Musical Ministries series. 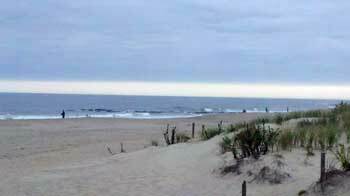 The Beach is open from Memorial Day through Labor Day, Monday – Saturday from 9 am - 5:30 pm, and on Sunday from Noon – 5:30 PM. Badges are required and can be purchased at the beach office at Ocean and Embury Avenues. They have public bathrooms, public changing rooms, a public gazebo, and umbrellas and chairs can be rented on the beach. During the early morning or evening hours, take a stroll along the natural wooden boardwalk. It’s a pleasant, relaxing stroll with no commercial amusements or concession stands. Wi-fi in public areas, free self parking, a lobby fireplace, and conference rooms. A good place to enjoy a romantic occasion or or a short stay getaway. 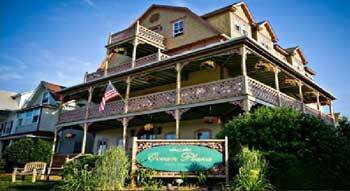 Has 22 rooms with different historical themes, most with private baths, ocean views. For relaxation, there are two porches, close enough to the ocean to hear the sound of waves rolling ashore. 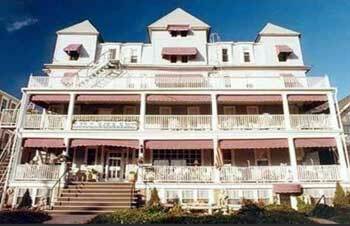 A Victorian B & B within walking distance to downtown Ocean Grove with its many quaint shops, restaurants and the famed Ocean Grove Auditorium. 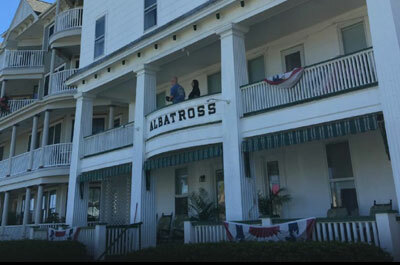 Open year round, guests can enjoy beautiful sunrises and sunsets, a swim in the ocean, a walk along the boardwalk, bicycling or just relaxing away from the hectic pace of the city. This is a place for the budget conscious traveler. It's low frills. It's an old fashion place with a charming lobby. It's near the beach. 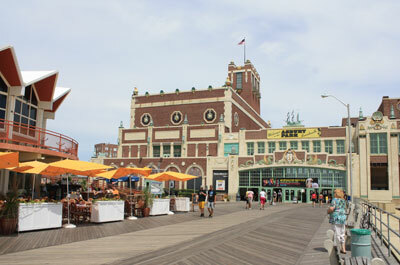 and near Asbury park. The cost is low for the area. 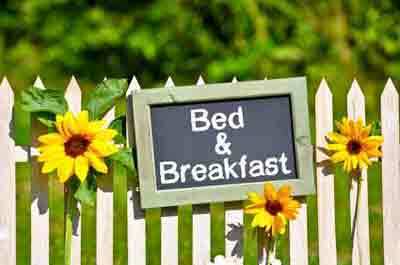 If you don't mind carrying your own luggage, and sharing bathroom and shower, you should be content with this place. 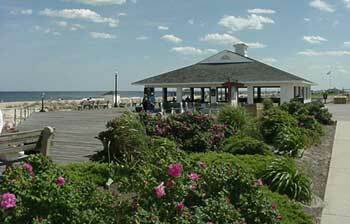 Discover the popular Ocean Grove restaurants with dining reviews.